Why Should I Buy a Rollator? A rollator can help you to preserve your independence when you find it difficult to move around on your own without assistance. Unlike a cane, rollators provide stability and support through three or four sturdy legs, and unlike walkers, wheels mean that you don’t strain yourself by lifting weight with each step. No matter what your size, most rollators are designed to adjust to different heights to offer a more comfortable ride and support good posture. Many rollators come equipped with a seat, which comes in handy during long or strenuous walks. If you find yourself getting tired, you can pull over at any time and take a seat on your rollator while you regain your strength. What Makes a Good Rollator for Shorter Individuals? Rollators come in all sorts of shapes and sizes to accommodate the wide spectrum of individuals that need a mobility aid. While most rollators are adjustable, they aren’t necessarily designed to meet the unique needs of petite individuals. If you are short, you may find that the majority of rollators are difficult or uncomfortable to use. Junior rollators are designed specifically for smaller individuals. These devices boast several features that make them an ideal choice for those who struggle with standard sized rollators. Seat Height- If a seat is set at too great a height, it may be difficult to sit and stand without assistance. A seat that is set at your preferred height will not only be more comfortable, but can also reduce your risk of slips and falls as you get into and out of your seat. Frame Weight- Junior rollators tend to be relatively lightweight, making them easier to push with minimal effort. A light frame also makes your rollator easier to carry and transport. Handlebar Height- A rollator for individuals under five feet should have handlebars that can accommodate a shorter reach. Many junior sized rollators have handles that are able to drop below 30” in height. There are hundreds of folding rollators available on the market today, but which is the best for you? 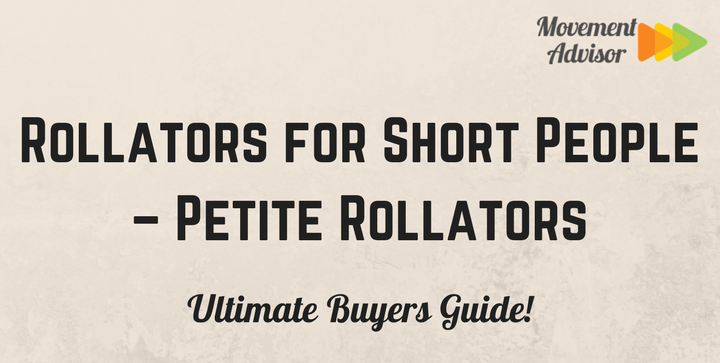 We’ve chosen several high-quality rollators that we recommend for petite individuals. Lightweight and comfortable, this rollator is designed for individuals standing anywhere between 4’11” and 6’4” in height. 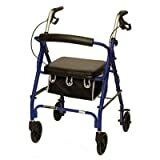 The handlebars of the Medline Freedom Rollator are able to reach between 29” and 36”, while the seat can be adjusted between 18” and 23” off the ground. The frame of this rollator makes it the ideal model for trips and outings, as it is completely foldable and portable. It weighs just 11 pounds, making it easy to carry and even easier to push. Despite its feather-light weight, this rollator is still able to support up to 250 lbs. A padded seat and backrest make this rollator a comfortable place to sit and rest. The model even features a convenient storage pouch where you can carry personal belongings, shopping bags, and more with you as you move. The pouch is completely removable and has a shoulder strap for ease of use. This ingenious rollator is designed with the active adult in mind. 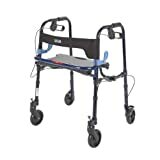 The Drive Medical Clever-Lite Rollator is small and lightweight, able to fold into a compact design that can fit into the tightest of spaces. A built-in handle makes it easy to carry the device around with you wherever you go. The seat even flips up to minimize the amount of space taken up in a closet, car trunk, or even suitcase. To unfold this rollator, you simply use the two levers located on either side of the assembly. The device has a patented dual-lever, side-paddle release system that makes it easy to assemble or disassemble the rollator in just minutes. When unfolded, the Clever-Lite Rollator is ideal for individuals of short stature. Its handlebars can adjust to heights as low as 29.5” or as high as 36.5”. The frame is constructed of a robust anodized aluminum that will last through years of heavy wear and tear. Internal aluminum casting makes up a special loop lock system that ensures your safety while seated in your rollator. The Lumex Walkabout Lite is a junior rollator that’s built specifically for the petite individual. 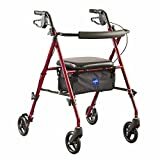 Its aluminum frame makes the device exceptionally light, with the entire rollator weighing in at just 11.5 lbs. A thick epoxy coating strengthens the assembly and protects against daily abuse. The handlebars of this model are adjustable between the heights of 27.5” and 32”, making it a good option for users under five feet tall. Ergonomic grips provide comfort and relieve tension in the hands and wrists while also making it easier to reach two handbrakes. A padded seat, a backrest, and a small storage bin also add a touch of luxury to this rollator, making it comfortable as well as functional. If you plan to take your rollator out of the house with you, the Lumex Walkabout Lite is easy to fold and carry. Its small size means that you can take it with you and use it practically anywhere, including both indoor and outdoor settings. The ProBasics Junior Rollator is a small but sleek device that offers a number of features suited towards smaller users. The seat is positioned at a lower height than you’ll find in most standard sized rollator models, sitting at just 19” from the floor. The handlebars can also be adjusted down to a height of 29”, reaching a maximum of 34” off the ground. The entire setup is narrow enough to move through hallways and doorframes and weighs a total of just 13 lbs. This rollator is not only well-built, but also attractive. You can choose from a stunning navy blue color or deep burgundy when picking a frame, and metal attachments come in a muted gold. Both the back brace and the padded seat are covered in faux leather, and a chic tote hangs under the seat to offer a convenient storage option for people on the go. When it comes time to pack up or store your rollator, this ProBasics model features a seat that’s easy to fold and a removable padded back that is designed to help you to save space in your closet. The Super Light Rollator from Health Line Products allows users to adjust between standard and junior rollator sizes at will, featuring the best of both worlds. Instead of adjusting the handles of this rollator, however, you adjust the legs to bring it to your ideal height. The seat can also be moved anywhere between 18.5” and 22” from the ground. This rollator boasts an aluminum frame that makes it both strong and lightweight. It’s foldable, allowing for easy storage and transportation, and weighs just 13.5 pounds. You can take this rollator just about anywhere with you, as the 6” soft-grip caster wheels help to absorb shock when rolling over both indoor and outdoor terrains. An internal loop lock braking system makes it easy to stop abruptly and lock your wheels in place for safety. If you’re concerned about comfort, this Health Line rollator offers a cushy seat and an extra-thick backrest for whenever you need a rest during the day. The model also features a carry pouch that sits safely under its seat for your convenience.